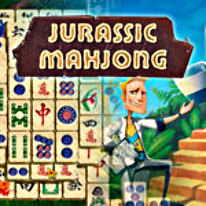 Mahjong in the age of the dinosaurs! Discover an alternative history! Travel to the prehistoric past of Mahjong with a scientist and his iron assistant. Something went wrong and the scientist found himself right in the middle of the Jurassic era, surrounded by hungry predators. Help the scientist make his way home – collect all the pieces of the time machine in the Wild Wastes and the Ancient Swamps. Classic Mahjong with a twist: special golden tiles you have to remove to win. Special levels with tiles appearing at random in the deal, along with deals themed in a fun prehistoric style. Each level has its own tasks you can complete to get an extra star. The expertly balanced levels will keep even professionals entertained, while not being too difficult for new players discovering this popular game for the first time. -Leave your mark on history!